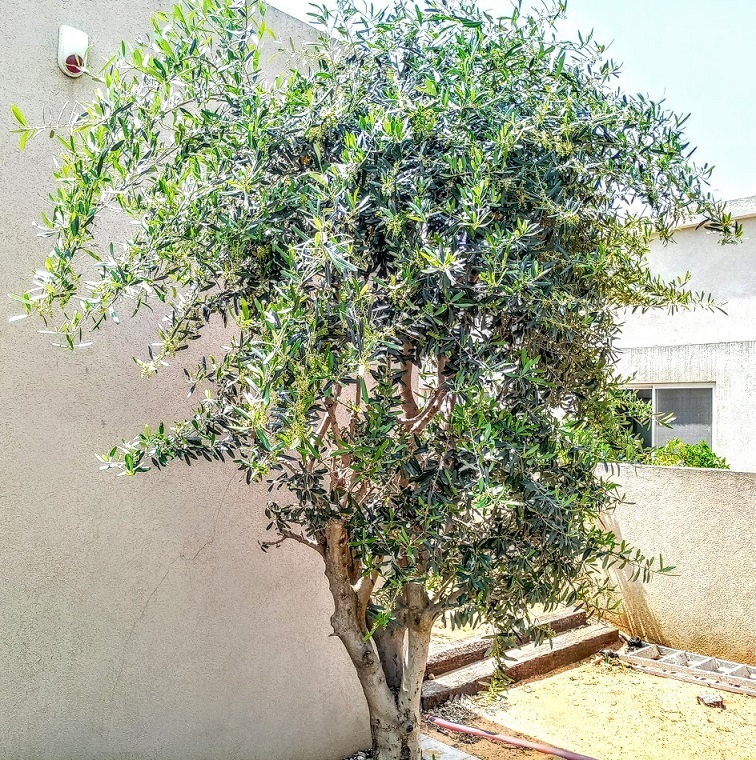 How to prune an olive tree? Or how to renew an olive tree? Why pretending you’re a ‘tree hairdresser’ is bad for the tree. How to prune in stages, for renewal. And that olive tree pruning can be done by hand. 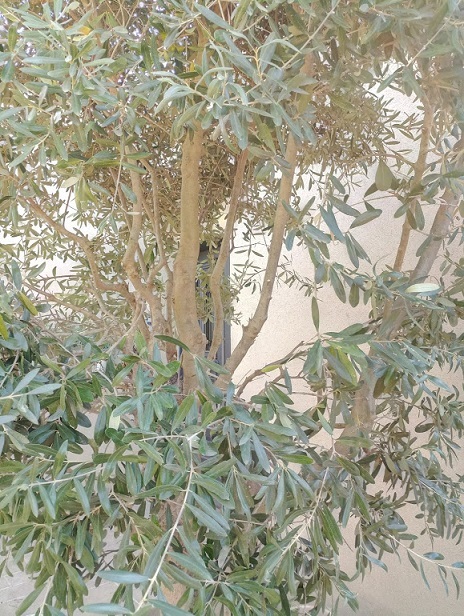 Olive tree pruning - The owner of this olive tree made two common mistakes. The first was planting it so close to his house. Olive trees, like most trees need space in order to develop properly. His second common mistake was to prune the tree from all sides with the aim of preventing its branches from touching the walls of the house. These conditions trained the tree the wrong way. The challenge here is double: There is no way to out root and replant the tree, so it can’t be relocated, and the owner wants to get the tree’s ‘natural’ look back. Here is what I decided to do under the circumstances. Especially with trees, always plan ahead before pruning. Take the time to thank what you would like the tree to look like in few weeks or months. My first step was to mark the height of the new, more natural looking tree. See the red mark across the canopy? That’s the point at which new growth will begin after I'm done executing my pruning plan. When to prune? Late winter until mid-fall. Olive trees are very strong and can be pruned during winter, if there is a specific need for it. But as always, try to avoid pruning in winter if you can. It’s always better to keep to the late winter until mid-fall cycle. Where to begin? 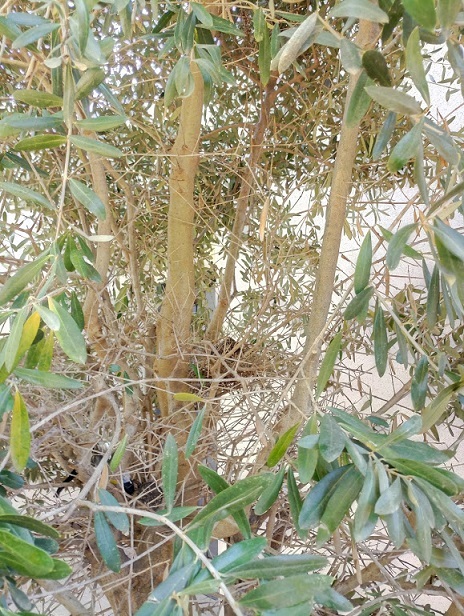 Start your olive tree pruning by cutting your way through the bushy leaves inside the tree’s structure. 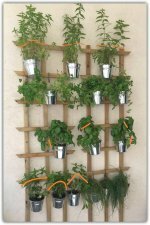 Cut until you reach the main stems, which is easy because the small branches on the inside are mostly dead and with a thin layer of leaves because they had no sunlight. Within 2 minutes or less you'll reach the main stem (see the hole I made in the tree? Notice how the main stem has been revealed). Great work! Now let’s move on to the second part of olive tree pruning. What should I prune next? This is one of my favorite parts. After making a big enough hole, start pruning by removing the dead branches and t​wigs, and make sure that you prune them as close as you can to the main stem. Now, while pruning the inner part you can also start to ​prune some of the green branches as well. 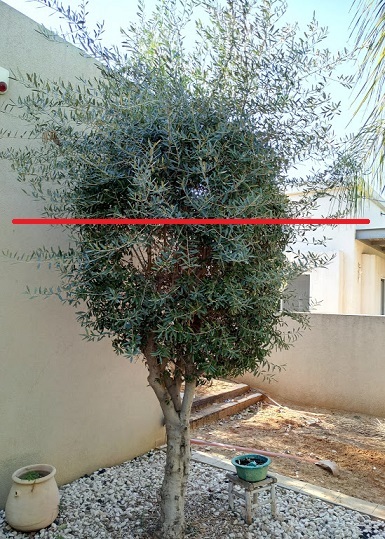 Remove all the branches below the red mark (No need to pull out a ruler and don't be hard on yourself if it’s not a precisely straight line)​. I’ll show you what I mean in just a moment. Why was it important to prune the way I did? ​Great question! I’m glad you asked. I could have simply pruned the tree in straight line along the red mark, BUT, that wouldn’t have shown us or told us anything about the situation of the main stems - are they rotten? how many are there? which one of the stems would be the best to base our new ‘natural look’ on? (Don't look for short cuts.. pun intended). Take a good look at the picture below and see what the tree looks like after it has been ‘cleaned’. Will I see the light? Of course you will! 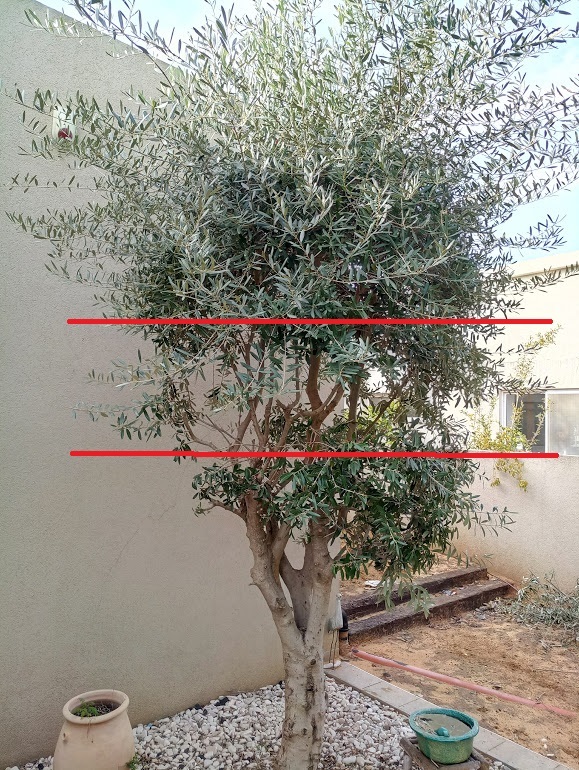 Now you can see a few stems, some are thin, others thick, but most important, by pruning this way and leaving a "belt" around the middle of the olive tree we can now see exactly where it’s at. You can see in the picture that I have created 360 degree visibility of the trees stems, this will help me decide what my next pruning move will be. Just for the fun of it, and it was fun(!) I left some fresh green leaves at the bottom, because I think it looks good. So, we have cleared and cleaned and the tree can now get better circulation of air. The main trunk will get a little sunlight, and slowly the tree will become healthier. We have already made huge progress towards making the tree look more natural, and over time it will be easy to make it more so. 1. I wanted to train the tree's new growth (on the side closer to the wall) to develop in a different direction. 2. Pruning the olive tree like I did will leave the tree looking less attractive (to say the least), until the new growth begins to come in. So, I didn’t prune the main stems at the front, only the back ones (close to wall). In this case, I will be back to prune some more, but only after I see some growth from the back. So for now the front of the tree will look no different. There’s no real reason to prune everything at once, although you could, I rather do things in stages And I have both the time and the patience. The benefit of taking your time is that you can see the growth as it comes in and plan ahead, plus at any point, if you get the ‘itch’ you can prune a little more. If you’re still not sure what to do with your olive tree, drop me a line through the "Pruning Box" – it’s on the right hand side of this very page. 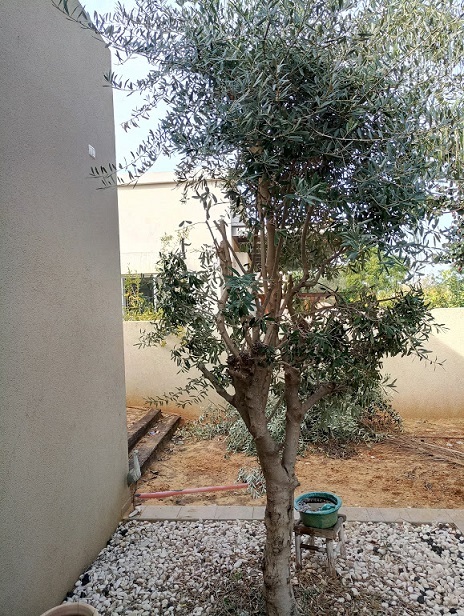 Olive tree pruning is fun and demanding at the same time, so stay tuned and I promise to keep you up-to-date on the growth and development of this very tree. My preferred pruning shears for pruning olive trees I suggest using heavy duty hand pruners. Olive tree pruning is always a challenge. Even the small stems are quite strong and flexible, which make them even harder to prune. The combination of professional heavy duty bypass hand pruner and anvil loppers will be perfect here.